TORONTO -- John Tavares has reaped the rewards of playing alongside Auston Matthews and Mitch Marner in his first season with the Maple Leafs. Getting to know Toronto's talented 21 year olds off the ice hasn't hurt, either. "They're both very different, but very driven," Tavares said earlier this week. "Great people and fun to be around. They bring a lot of energy to the group. "For a guy like me who's a little bit too serious sometimes, it helps me out," the 28-year-old added with a slight grin. "They're extremely talented hockey players, and you can see how bad they want to be great." That desire to be great is something Tavares knows a lot about. In the hockey spotlight since the age of 14, he's now in his 10th NHL season and first with Toronto after signing a big-money deal on the opening day of free agency on July 1. Excellent in his own right so far with the Leafs, Tavares has benefited from Marner's setups as the slick winger's centre at 5 on 5. He's also been on the receiving end of both players' passes on Toronto's potent power play, including from Matthews for a tap-in goal to open the scoring in Wednesday's 5-3 home victory over the San Jose Sharks. Tavares knew Matthews and Marner were good. He just didn't know how good. "You can just see their skill sets on a daily basis, just how great they are at playing the game and their understanding of their capabilities, and bringing it consistently night in and night out," said Tavares, who has a team-high 17 goals to go along with 13 assists. "You see the drive and determination they have in practice or in games to be successful and be the players they want to be." 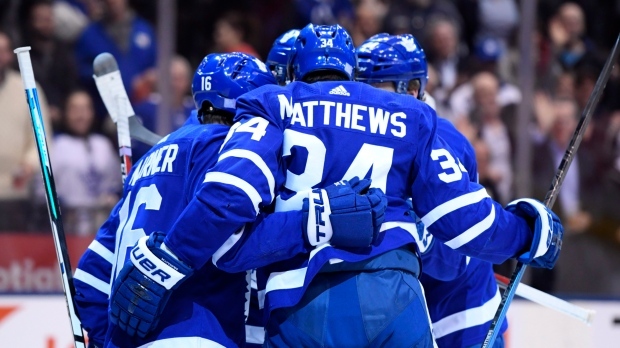 Marner is third in NHL scoring with 36 points and second in assists with 30, while Matthews has 12 goals and seven assists despite missing 14 of Toronto's 26 games with a left shoulder injury. While Tavares may not have initially understood everything the pair brought to the table, the two youngsters didn't know the true value of their veteran teammate either. "He's exceeded them," Matthews said of his expectations for Tavares. "Playing against him, you know how hard he competes. Being around him, it's been good for us just like it's been good for him. We all bring different things. "Me, Mitch, a lot of the younger guys on the team joke around and have fun. He's a pretty serious guy. It's kind of nice to see that side of him opening up." Jokes aside, though, Marner said the leadership of Tavares, 39-year-old winger Patrick Marleau and 37-year-old defenceman Ron Hainsey can't be understated for a team that sits 18-8-0, good for second in the NHL's overall standings heading into the weekend. "They calmed us down in those late minutes of games," Marner said. "Before when we were young, we threw the puck away too much. We had a lot of speed throughout the whole game, but at the end we got too nervous when we had a lead. "These three guys coming to our group just added calmness." Leafs head coach Mike Babcock said having that veteran presence in the locker-room isn't an accident. "They set a standard here of excellence," he said. "It's a good group to follow. We've got a lot of determined guys on our team. That's what we've tried to do over the last four years ... get quality people that want to be great. "When you have that in your group it makes it easier." Tavares, meanwhile, is hoping to get a much longer look at restricted free agent William Nylander after skating with him a few times in the summer. The 22-year-old winger and the Leafs have until 5 p.m. ET on Saturday to get a deal done on a new contract so that Nylander is eligible to play in the NHL this season. "We want Willy here," Tavares said. "He's a great teammate and a hell of a player. Hopefully we get him back in the fold. "We know what a difference-maker he can be." Tavares himself has been a difference-maker in Toronto by mostly employing his usual all-business approach, but he's also appreciated the opportunity to get to know and play with free spirits like Matthews and Marner. "That just brings it out of everyone in the locker-room, not just myself," he said. "It's great to be around guys with that type of energy, hunger to play, and ability to just enjoy what they're doing everyday. "Especially in a spotlight like this."